The 1st Rheumatoid Arthritis Awareness pin is here! 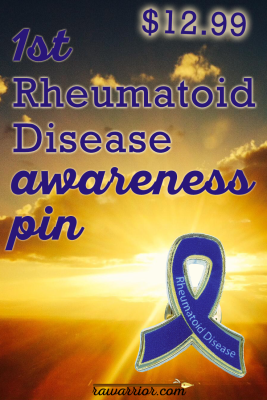 We finally have a Rheumatoid Arthritis awareness pin / Rheumatoid Disease pin to wear. The digital version has been very popular over the past few years, but many asked me to get them a “real” pin. 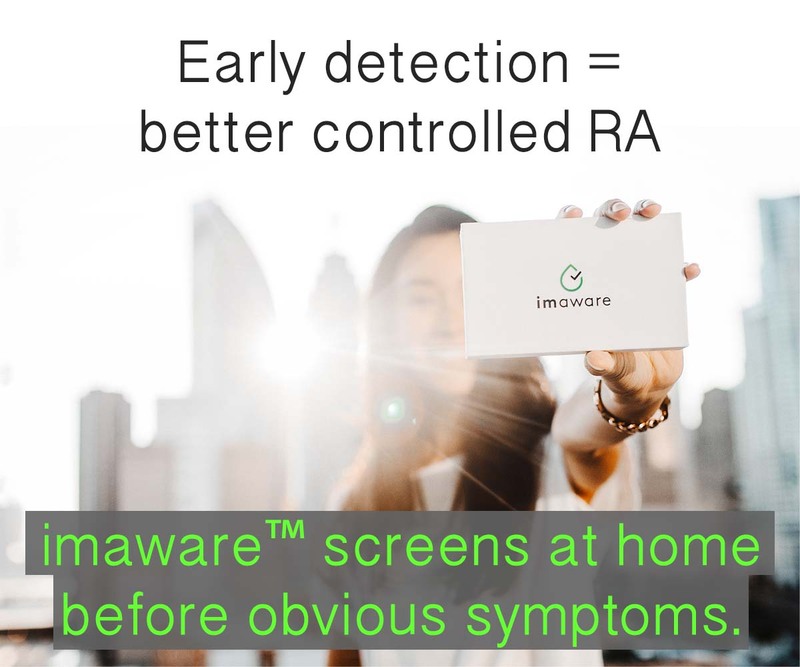 It’s been a long road to get this just right, but I’m so happy to say this is the beginning of another important change for people with Rheumatoid Disease (PRD). PRD have a symbol that sets their diagnosis apart from any other, saying We Need More Research and a Cure. Period. A perfect time to wear a Rheumatoid Arthritis Awareness Pin! 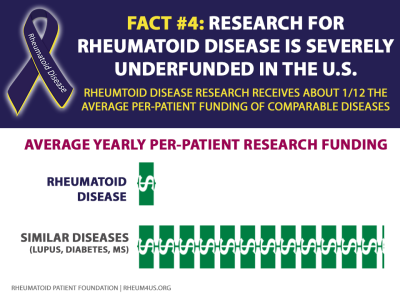 February 2 is the 4th Rheumatoid Awareness Day – that’s next week. Yes it’s also Groundhog Day and Candlemas and more – read more about the significance of the day here. You can read more about the meaning and symbolism of the Rheumatoid Arthritis awareness ribbon, and if you’d like to add one to your Facebook or Twitter profile, visit the Twibbon site here. 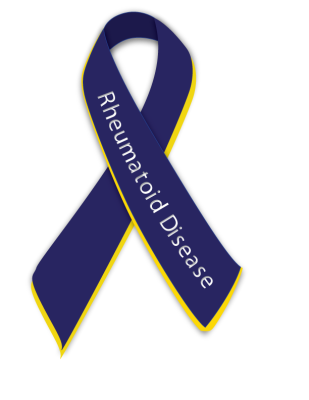 Feel free to grab the digital Rheumatoid Arthritis awareness ribbon image at the bottom of this article to use on your own blog or website. 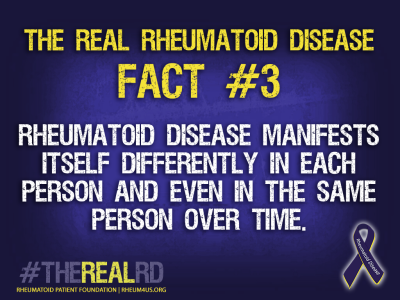 The theme for Rheumatoid Awareness Day 2016 is The Real Rheumatoid Disease or in the shortened hashtag form #TheRealRD. There are 7 facts to summarize the truths that will combat the typical misinformation and minimizing that occur in the media (and about everywhere else) with RD. See all of the images and read more about the theme in Dana’s post here. Grab as many of these images as you like and post them on Facebook or Twitter, or Pinterest or Instagram, or Tumbler, or use them on your blog. There’s much more from the Rheumatoid Patient Foundation site about what you can do to spread awareness. For more awareness images, click here (and check back later for more). 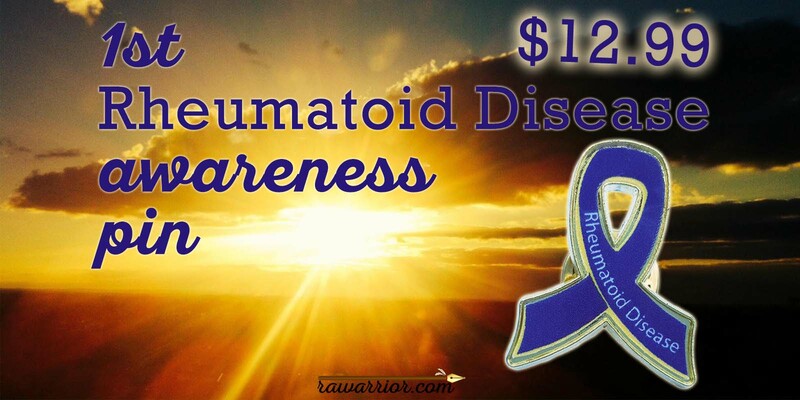 The RPF images are also prompts for blog posts relating to Rheumatoid Awareness Day. Any of the 7 #TheRealRD facts would be a great blog post topic. 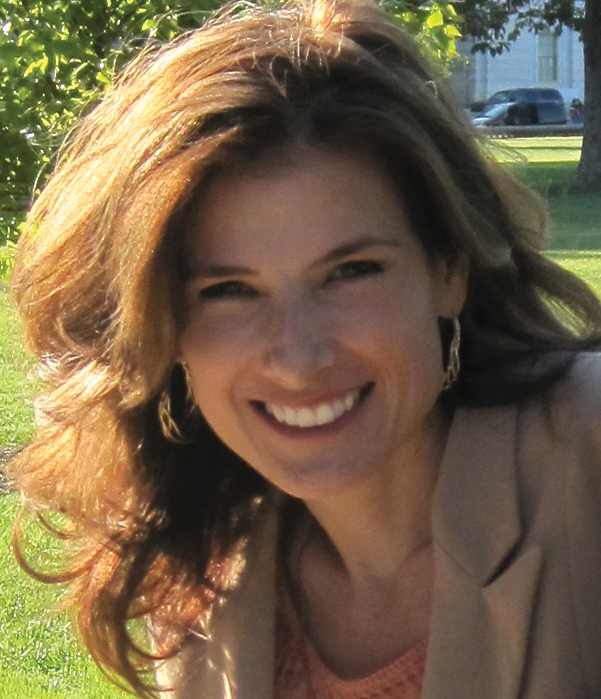 I’ll rally Dana’s challenge and make it a blog carnival to spread your message far and wide. If you have any kind of blog, write a post using one of the prompts for Rheumatoid Awareness Day. Then send me the link and the title and I’ll post them all together February 6 inviting people to visit your blog. 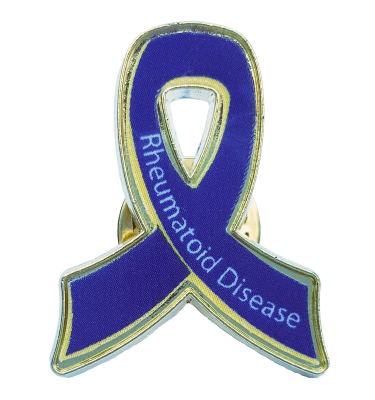 Note: If you use Amazon’s sites outside of the USA, I’m working to get the Rheumatoid Arthritis Awareness Pin available there asap. You can comment to let me know you’re interested so I can get an idea how many to send there. 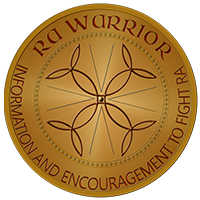 1) If you get my new RA Warrior blog posts a couple of times a week in your email inbox, that is through a service of Google. That’s called “the feed” – just new posts as they are published. If you have not signed up for those, click here to sign up. 2) If you receive a letter from me a few times a year called The Spear, that’s my personal email letter. You have to sign up separately for that. If you got one this morning January 28, then you are signed up! If you did NOT get a letter from me this morning, then you still need to sign up here – Click here. It’s fine to sign up for both so you don’t miss anything. Postblog: Why did you use both the words “disease” and “arthritis” in the name of the pin? Simple. People are looking for the pin using either word, and I want them to be able to find it. Thank you. Ordered mine. ? Hi, I love the awareness ribbon pin. I told my husband about RD Awareness Day coming up and he asked me if we had a ribbon – now I can say yes! ☺ Please make them available in Canada as soon as you can and then let us know. I’m not an Amazon shopper but I will become one to get the pin. ? Thank you for sharing this, I ordered mine and it shipped today!